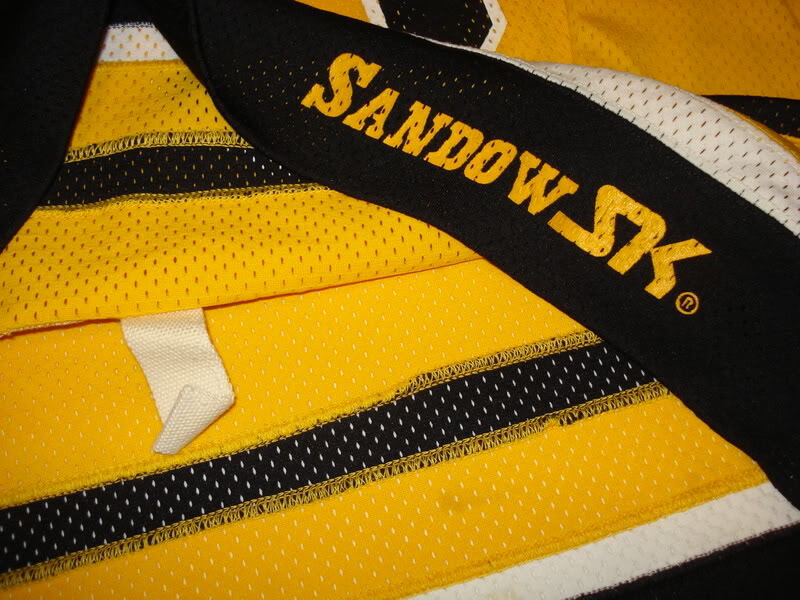 These were Wilson brand jerseys but the team customizer added their own Pittsburgh Sport Shop tagging. 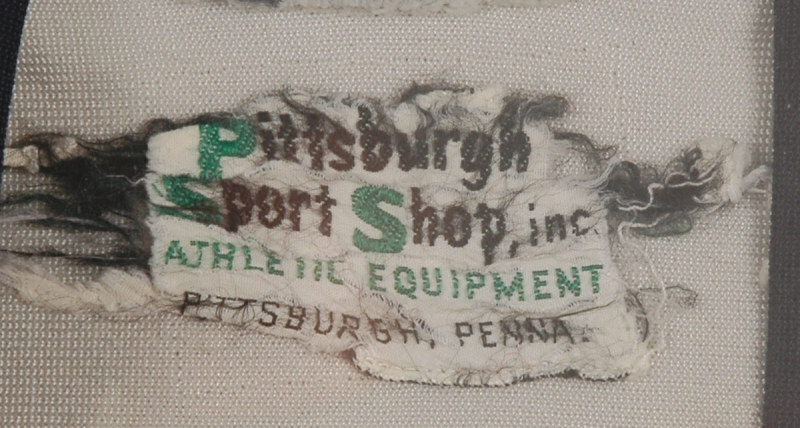 Some examples have been found with the Wilson tagging still intact, and others have had the Wilson size portion of the tag tacked beneath the Pittsburgh Sport Shop tag. 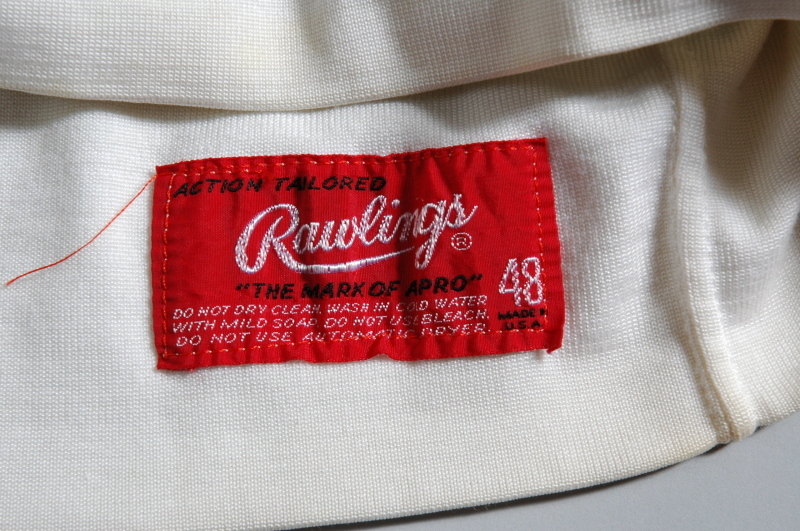 Tag attached to inner hem reads "Action Tailored The Mark of a Pro." For 74-75 the Rawlings manufacturer tagging was moved into the inner collar where most traditional manufacturer tagging is still attached today. 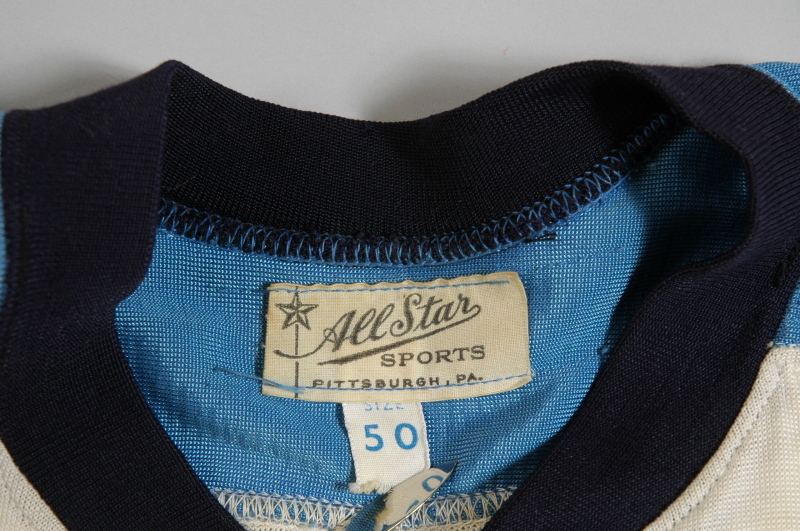 75-76 jerseys were tagged the same way, but 74-75 jerseys will have double thick numbering as opposed to the single layer used the following year. 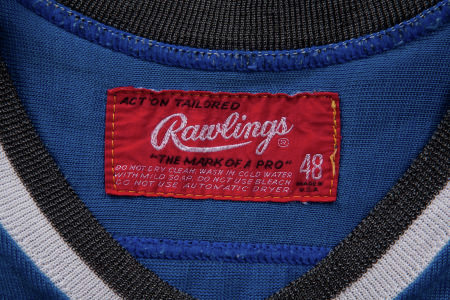 The 74-75 jerseys will have a white hem while the 75-76 will have a heathered black hem. 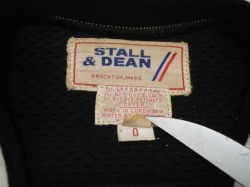 Has born on date beneath size tagging with a garter type strap. 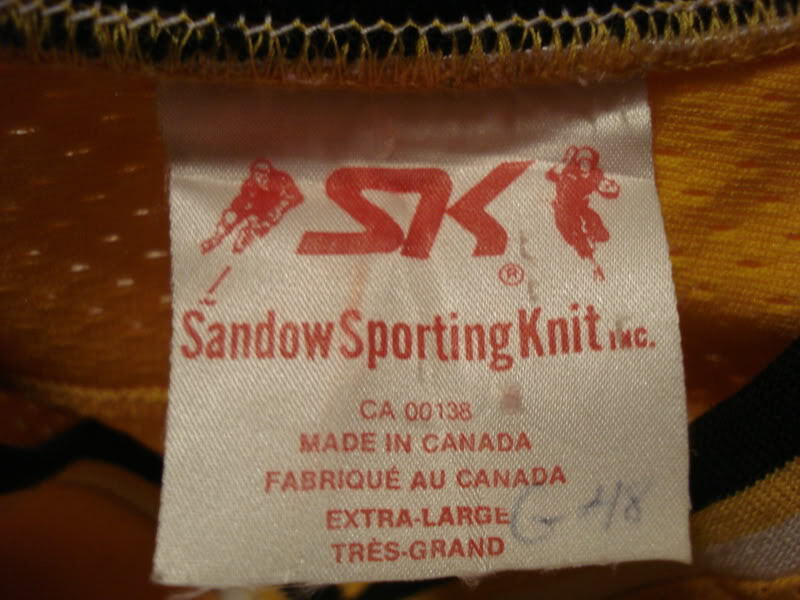 There were several versions of the Sandow SK tagging. Look very carefully. XXL or XL flag tags only in these extremely rare shirts. 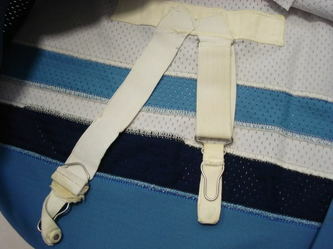 Many of the GA jerseys have custom fight straps which were attached by the team. 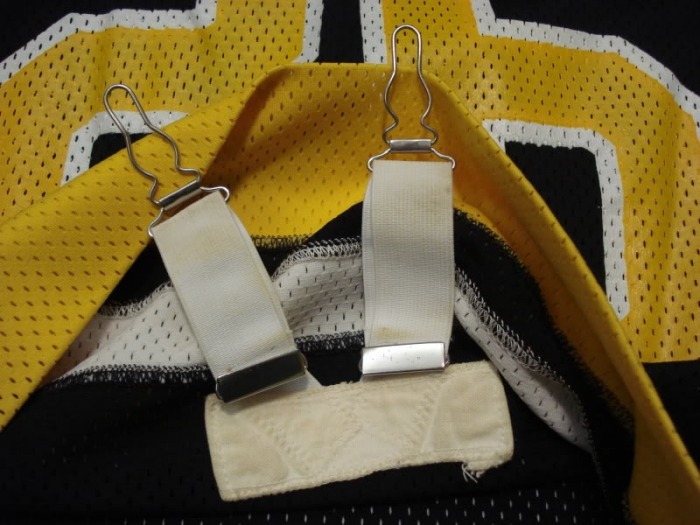 They are made out of strapping material like you'd see on the handles of an old equipment bag. They are reinforced through the double layer back numbers and have a snap type closure. 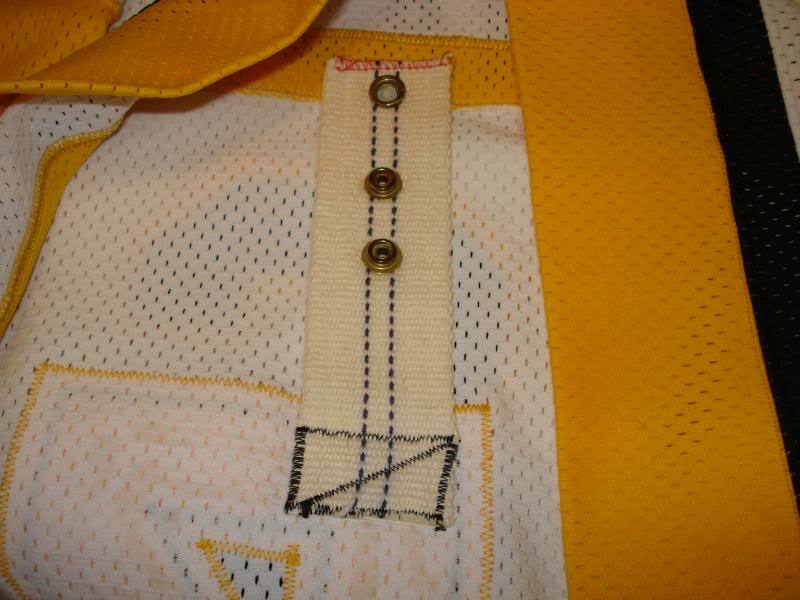 This is the precursor to the modern velcro/snap type strap that we saw appear in CCM shirts in around 87-88 and that you still see in today's modern jerseys. This tag shows an odd fading and is atypical of these set tags which seem to wear pretty well actually. 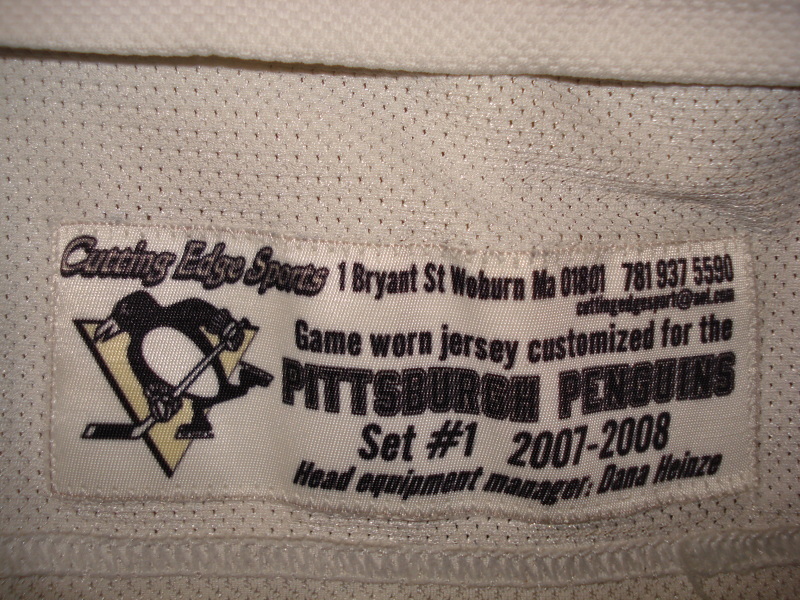 This road white set was carried over into the first 12 games of the 05-06 post lockout season. 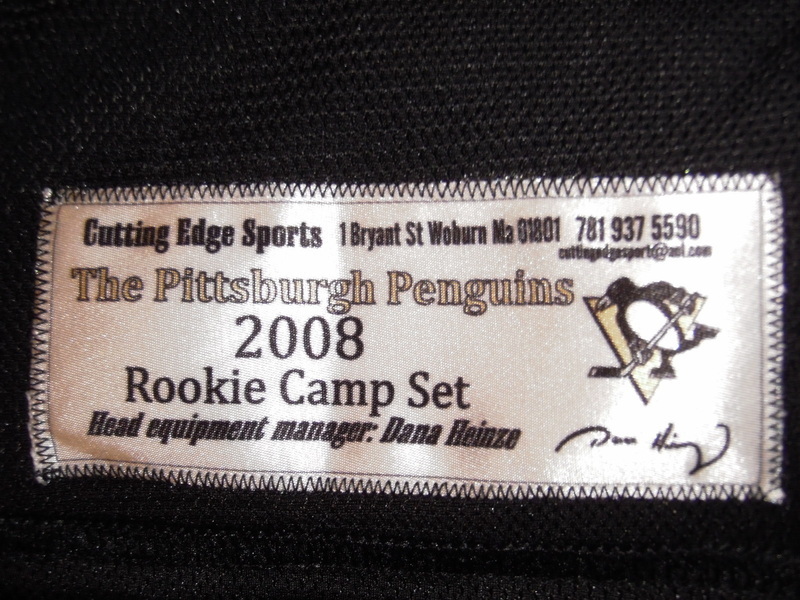 Equipment Manager Dana Heinze added "Training Camp" designation to all camp jersey fight straps. Provided by Rbk at no cost to the teams, and following their use on October 8th, 2005, this set of jerseys was and auctioned off on NHL.com with the proceeds going to provide relief to the victims of Hurricane Katrina. This is the breast patch that was attached to the special Katrina relief jerseys. 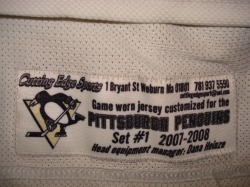 These were used in the 1st set of regular season jerseys in 2005-06. These set 3 tags have a noticably different font than Cutting Edge had been using previously. 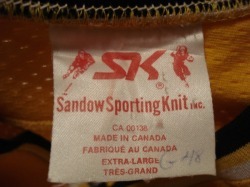 Still showing the "customised" spelling. 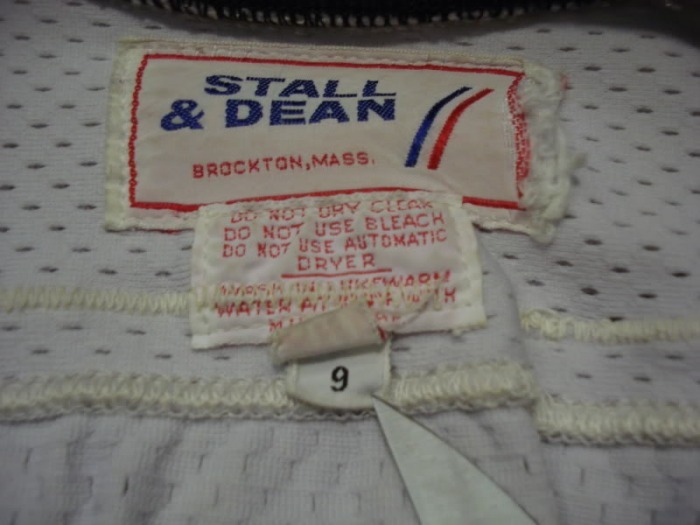 These playoff jerseys were also labeled as set #3. 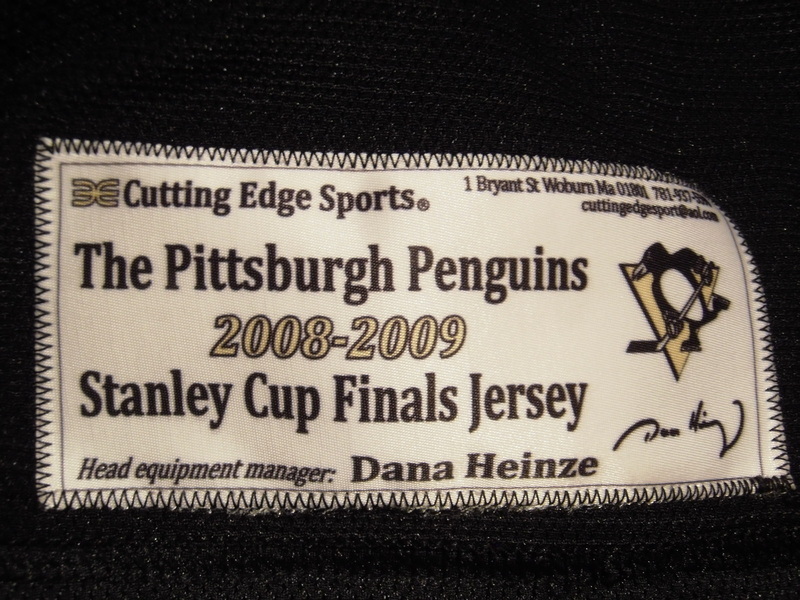 Worn at home games during the preseason & for the regular season home opener. 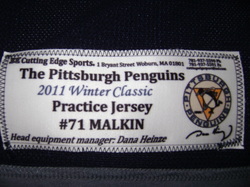 Jerseys from this set will be the stretchy 1.0 Edge material and will have the 250 patch placed up high on the shoulder. 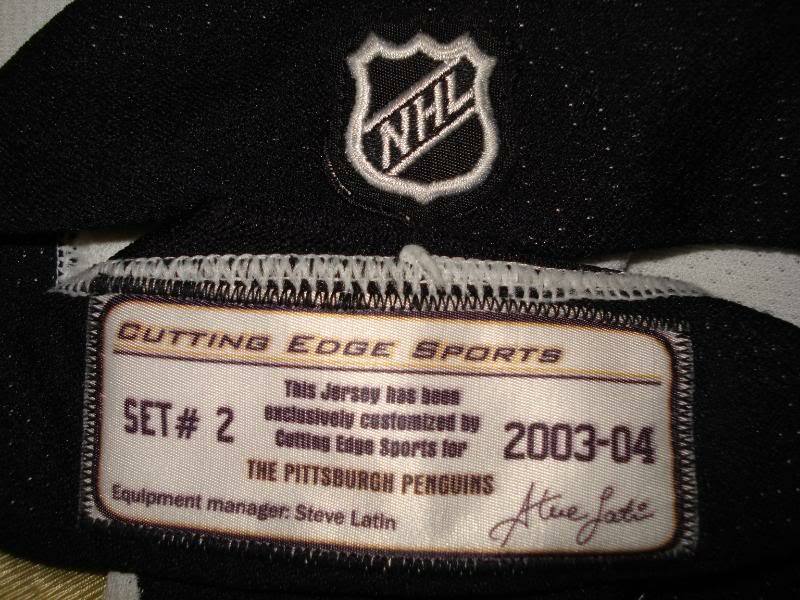 This was the first dedicated preseason set created for the Pens. Marked set #1 but used exclsuively in the preseason. Home black set was tagged "Community Relations." 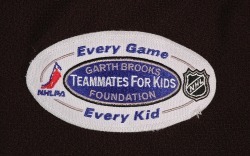 This special one game only set of home jerseys were auctioned off to benefit the Garth Brooks Teammates For Kids Foundation with Garth matching 100% of the proceeds of the online auctions which were held online at NHL.com. 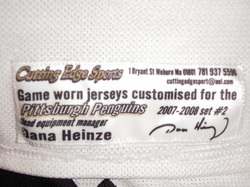 Pittsburgh wore the jerseys at home on January 7, 2007 against Tampa Bay contrary to the tagging that states a game date of January 9th, 2007. 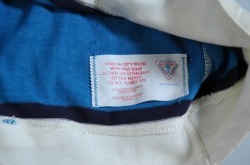 These jerseys also carried a special patch attached to the left breast. 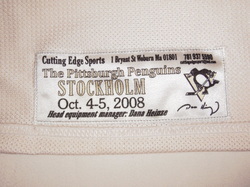 This tag was used exclusively in the 2 sets of jerseys worn in the opening games of the 2008-09 season in Stockholm Sweden held on October 4th and 5th against the Ottawa Senators. 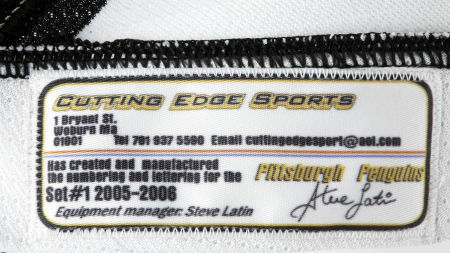 These tags were sewn in special dedicated one game wonders that were auctioned off to benefit The Mario Lemieux Foundation. 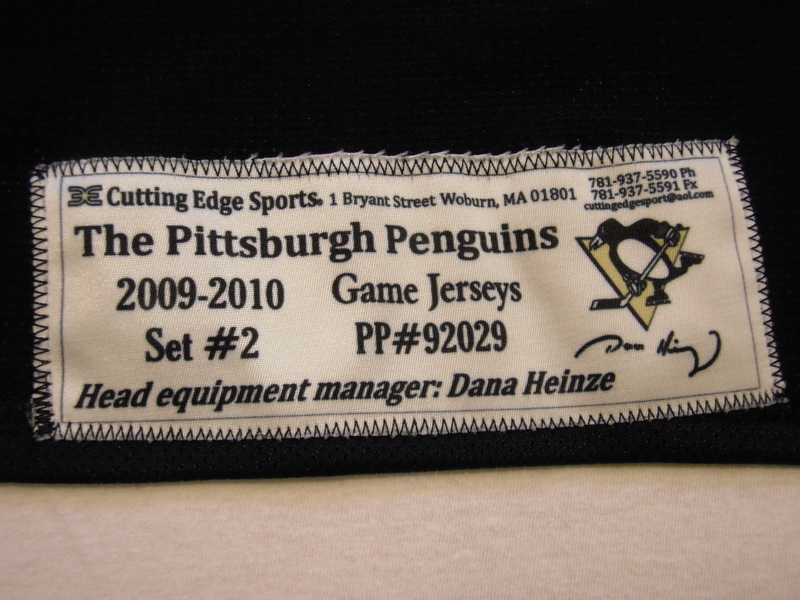 This is the first set of regular season jerseys, tagged set 2 as the preseason set is tagged set 1. 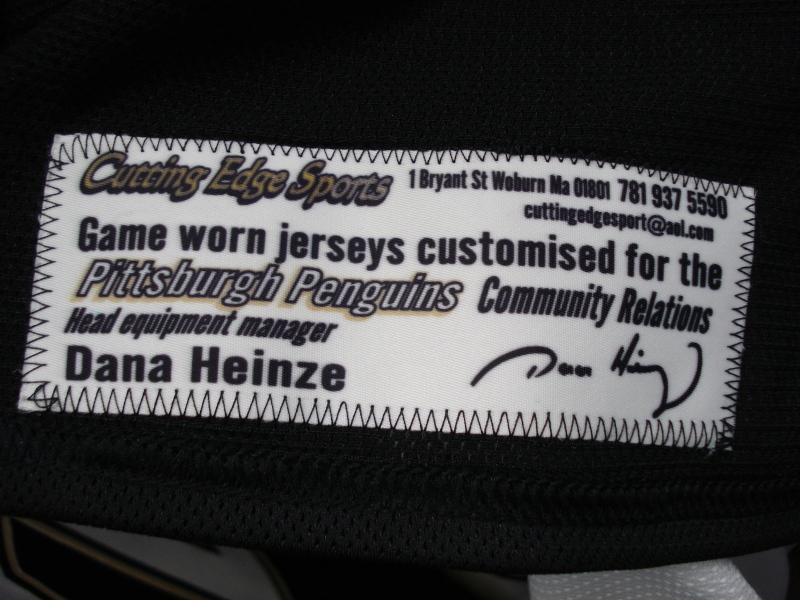 The preseason "Community Relations" tagged home blacks were also worn in the home opener vs Anaheim. 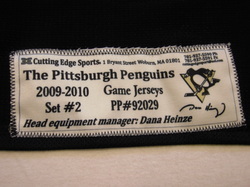 These set 2 jerseys are made of the Edge 1.0 material and are the only set of regular season jerseys that were constructed this way. 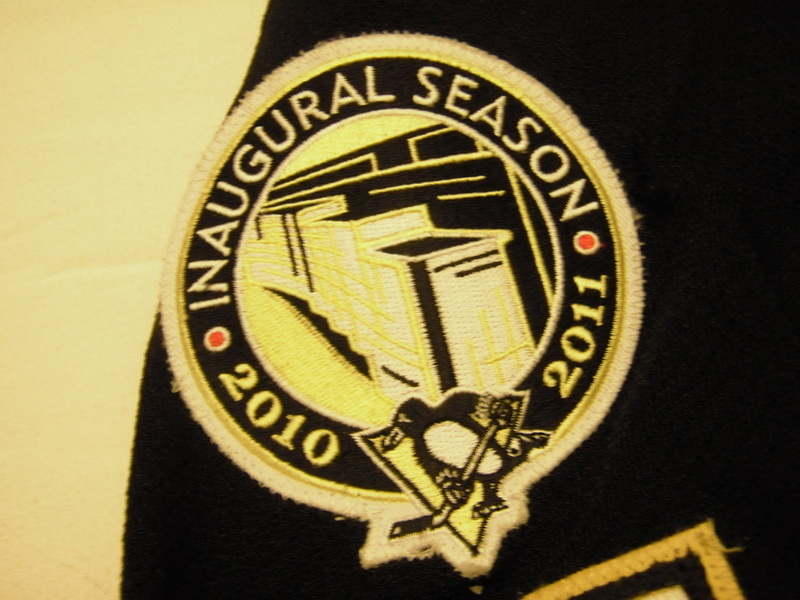 250 patch is moved down on the sleeve after the league gave the Pens a hard time about not having applied for a "shoulder patch." This set was only worn from the start of the season until mid November. 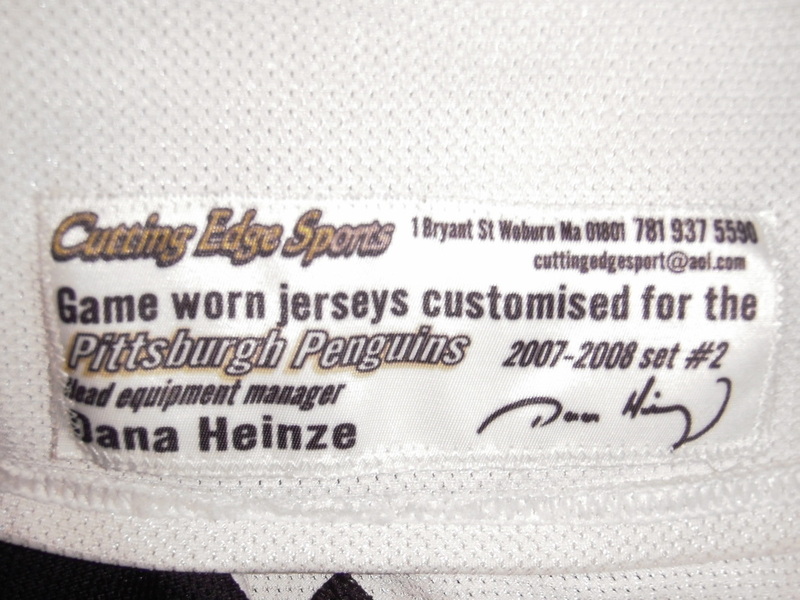 Still spelling it "customised" even on this 3rd set of jerseys. 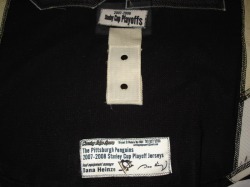 This set was worn from mid November until the start of the playoffs. 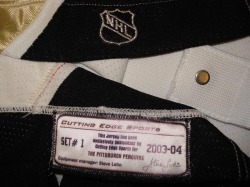 This set is one of the best for wear because of the extended time frame in which they were worn. 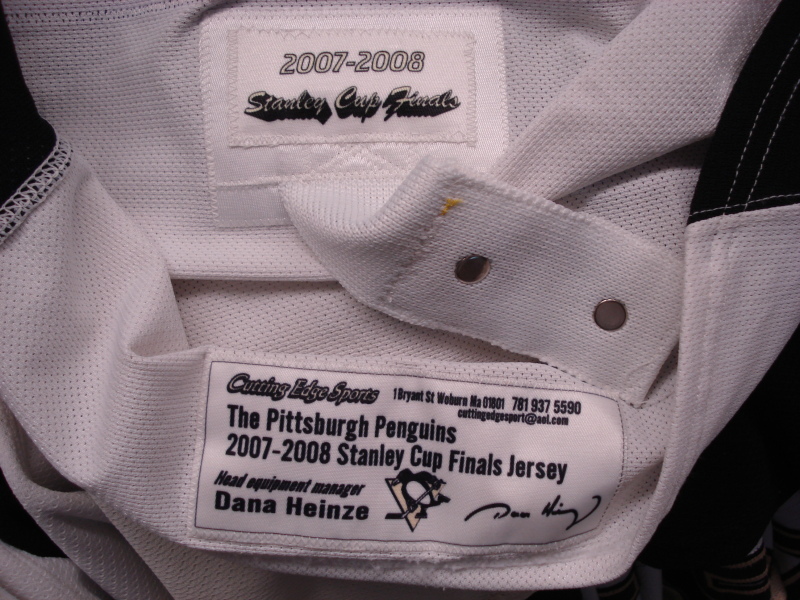 Additional tagging attached to the fight strap to denote it at a 2007-08 playoff jersey. Finals jerseys carried an additional tag on the fight strap reinforcement. 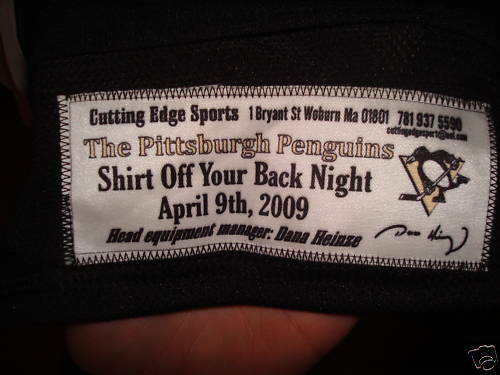 Penguins Fan Appreciation and "Shirts Off Your Back Night" was held on April 2nd, 2008. Here's the 2008 Rookie Camp specific tagging. 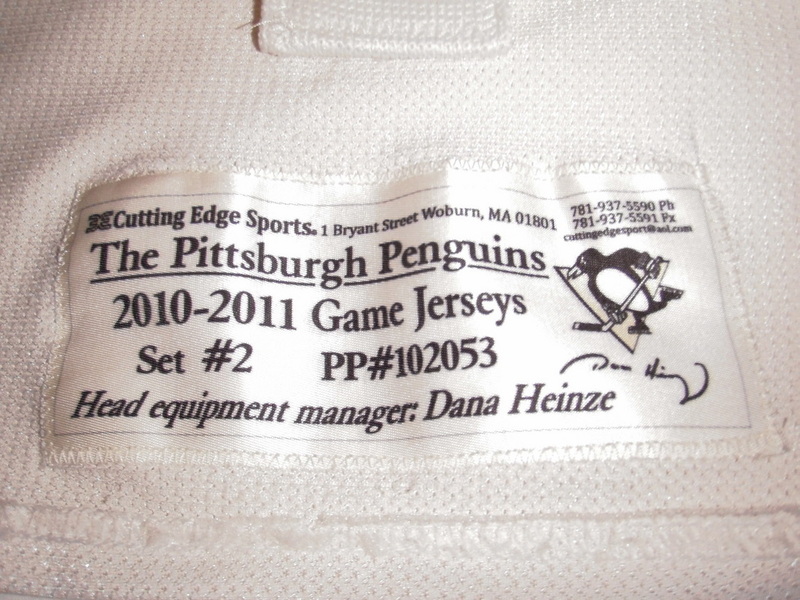 Dana and Cutting Edge have done a nice job of creating tags for even training camp jerseys these days. Nice looking bold set #1 tag. Looks very similar to the 07-08 Preseason/Set 1 tagging. Winter Classic jerseys had this unique tagging, also will have MeiGray tagging in hem. This is the tagging used in the blue alternate set(s). 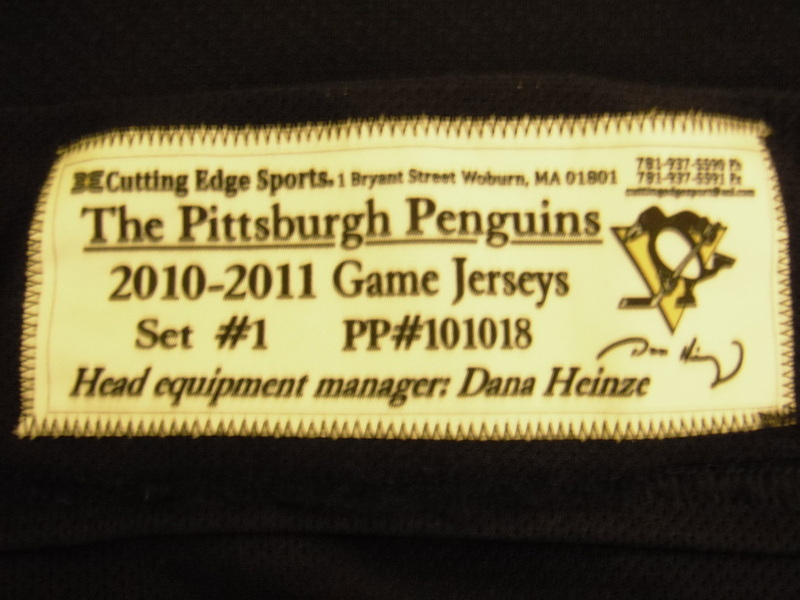 Depending on the player and assignment of the Alternate Captain's "A" multiple sets exist. 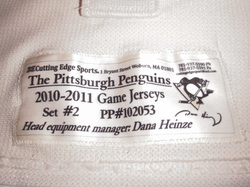 These jerseys carry specific tagging and were given to lucky fans following the April 9th, 2009 home game vs the Islanders. 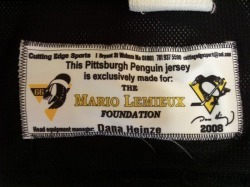 These are part of the Pens' annual Fan Appreciation Night giveaways. 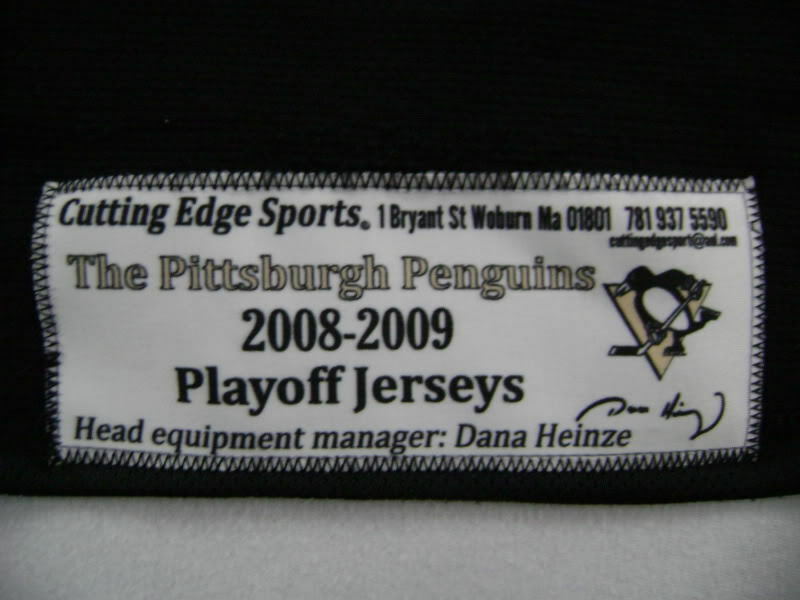 No additional fight strap tag was used on playoff jerseys in 08-09. 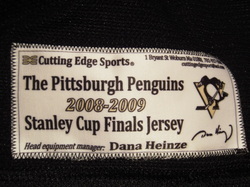 It is said this was done out of superstition based on the Pens loss to Detroit in the previous years' finals. No additional fight strap tags were used in the finals jerseys this year either. 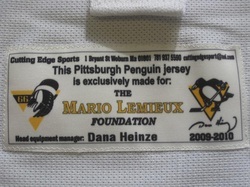 A great looking tag and a very exclusive jersey for any Pens collector. These set tags were used in the 2009 rookie tournament game jerseys. This is the set 1 tagging for the 2009-10 season. The first to feature a unique serial number on the set tag itself. These numbers are not consecutive nor do they appear on the jersey's original team LOA. It is unknown at this time what purpose the PP#XXXXX numbers serve. These tags are identical to the set 1s, save for the set 2 numeral. Serial numbers seem to be increasing. This is a much smaller tag that is present in the rear hem in addition to the regular Set 2 tagging as seen above. 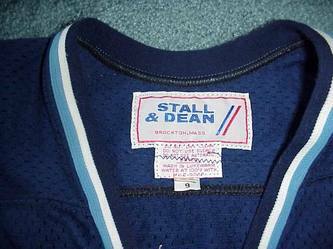 These jerseys were worn for the first 2 periods of that final game vs the New York Islanders, but a separate set of jerseys were worn in the 3rd and were tagged with the traditional Shirt Off Your Back Night tagging. That set of jerseys were given away to lucky fans in attendance that night in an on ice post game ceremony. 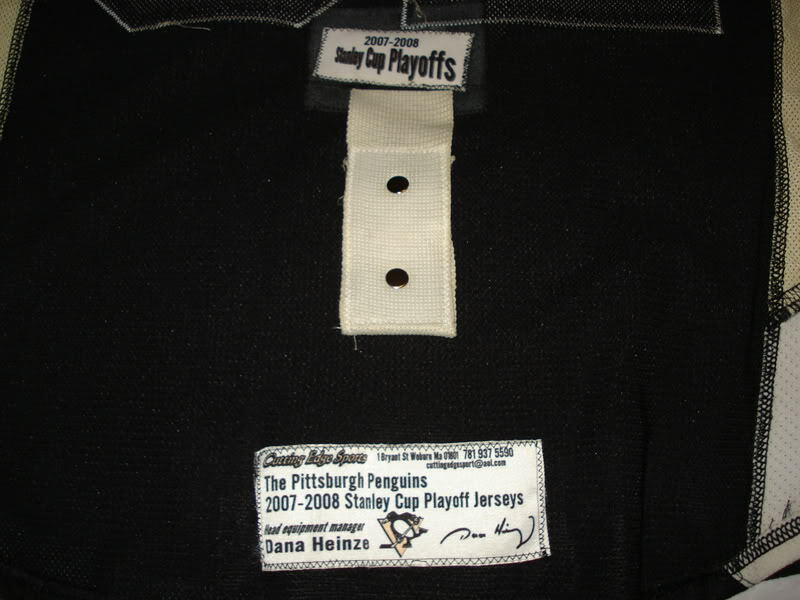 2009-10 Playoff tagging. 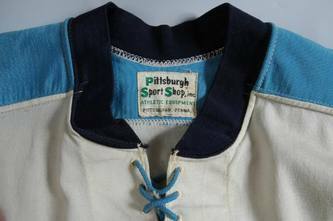 These jerseys saw 2 rounds of play before the Pens eventually were eliminated by the Montreal Canadiens in game 7 at home in the Igloo. 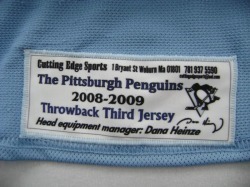 This is an example of thetagging used in the blue 2009-10 alternate jerseys. These carry ID numbers as well as a blue lettering and triangle behind the Penguin. 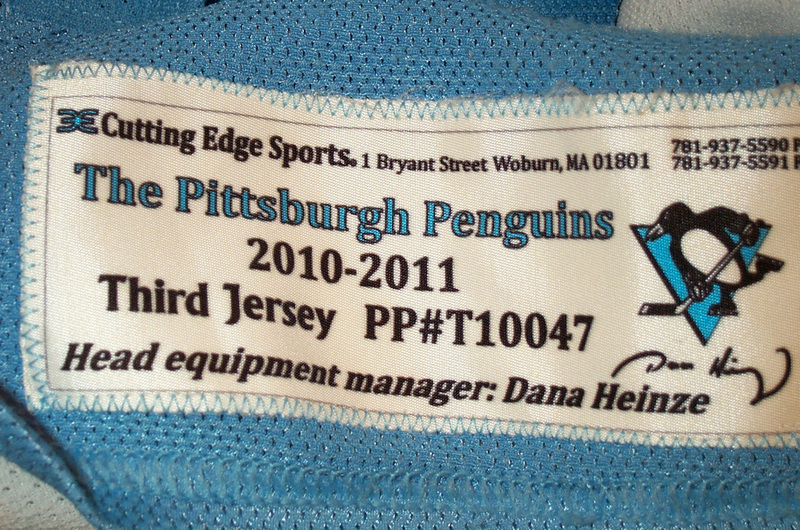 These tags were sewn in special "one game wonder" jerseys that were auctioned off to benefit the Lemieux Foundation. 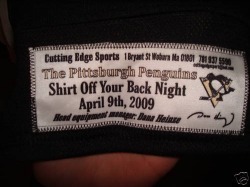 These were used on 3-17-10 against NJ. 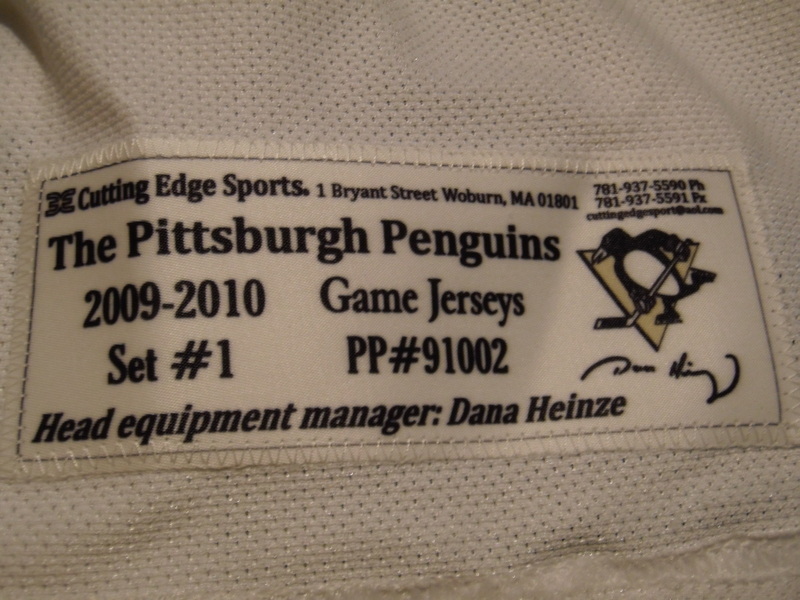 This was the first set of jerseys used in the new Consol Energy Center. 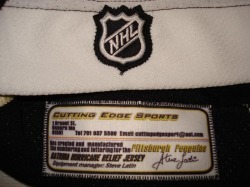 Was worn in the preseason as well as regular season games until mid December. 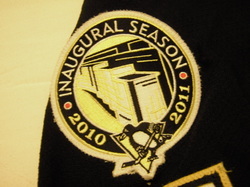 The 2010-11 season jerseys are easily identifiable by the Inaugural Season patch attached to the right shoulder. With no mention of the Consol Energy Center it almost looks like it's commemorating the Penguin franchise's inaugural season. 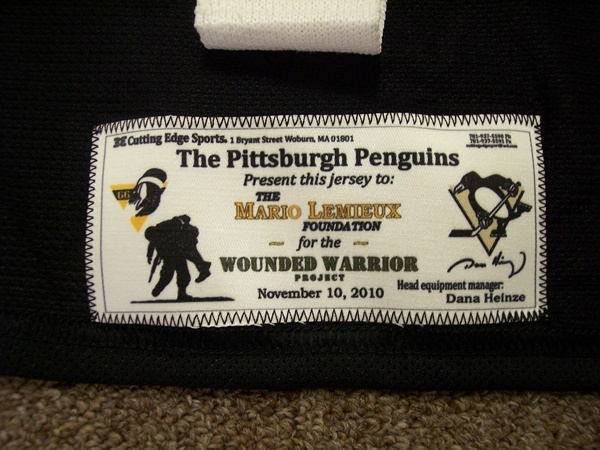 This was an exclusive set tag used in Mario Lemieux Foundation charity auction jerseys that were specifically earmarked as part of the Wounded Warrior project to benefit the new Austin's Playroom at Walter Reed National Military Medical Center. These were used at home on Veteran's Day, 11-10-2010. 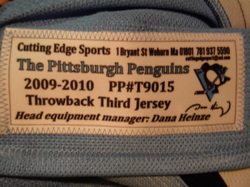 This is the set tag that was used in the set of power blue alternate style jerseys that the former Penguins players wore on December 31st, 2010 in the Alumni game preceeding the 2011 Winter Classic. 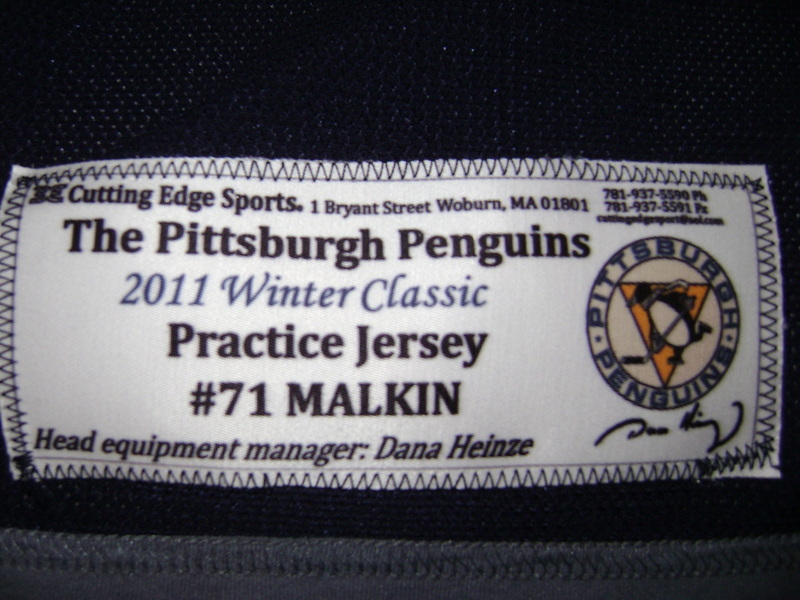 Each practice jersey worn by the Pens prior to the Winter Classic and immediately following the Alumni Game were affixed with player specific set tags indicating the player they were assigned to. Forwards wore dark blue jerseys and defensemen wore white. 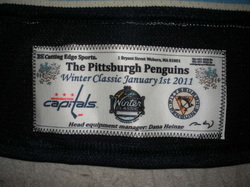 This is the tag sewn into the rear hem of the 2011 Winter Classic jerseys. 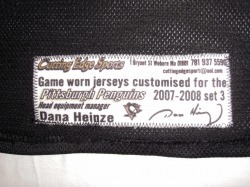 There will be 4 jerseys prepared for each player on the roster including Ben Lovejoy and Chris Conner who did not play but had jerseys prepared for them. 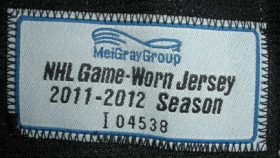 The 1st period jerseys will also carry a MeiGray tag and serial number. 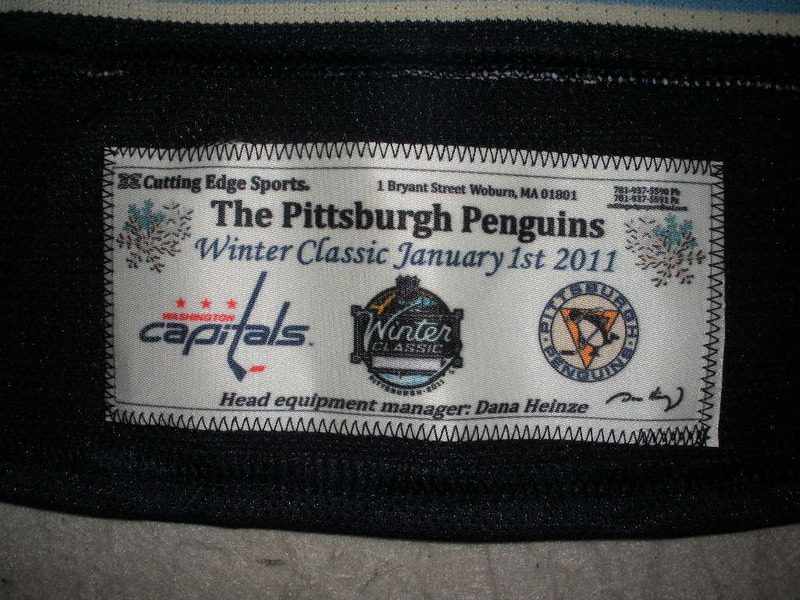 I am surprised to see Dana chose to include the Capitals logo on the set tag. In hindsight it appears to have been bad luck...haha. 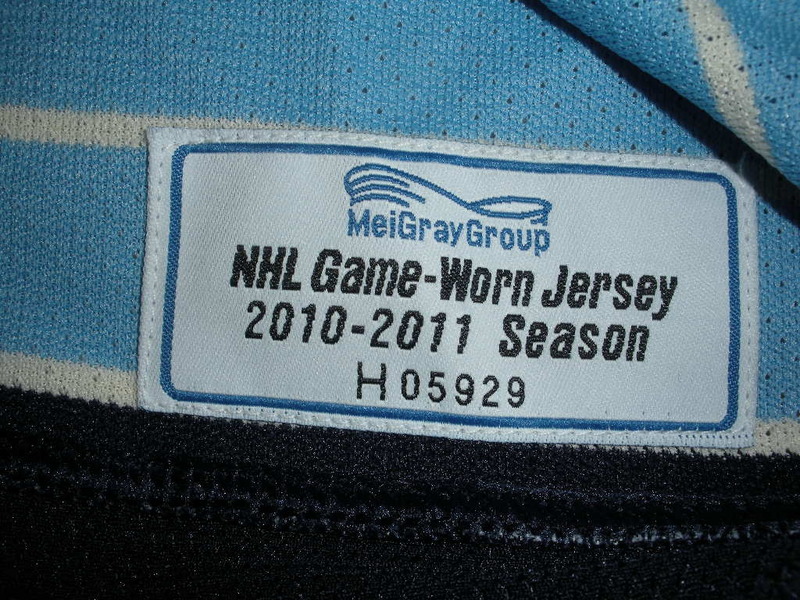 This is the MeiGray tag that from inside Sid's 1st period MeiGray auctioned jersey. The Winter Classic jerseys also have a unique "Winter Classic January 1st 2011" inscription sublimated into the inner collar which makes for an interesting special feature on these jerseys. Maybe we'll see this incorporated into set markings in the future. This is the individually serialized set tag that is attached in the rear hem of the 2010-11 Set 2 regular season jerseys. 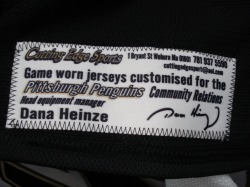 These jerseys will also have the inaugural season patches on the right shoulder as they were to commemorate the first season in the new Consol Energy Center. 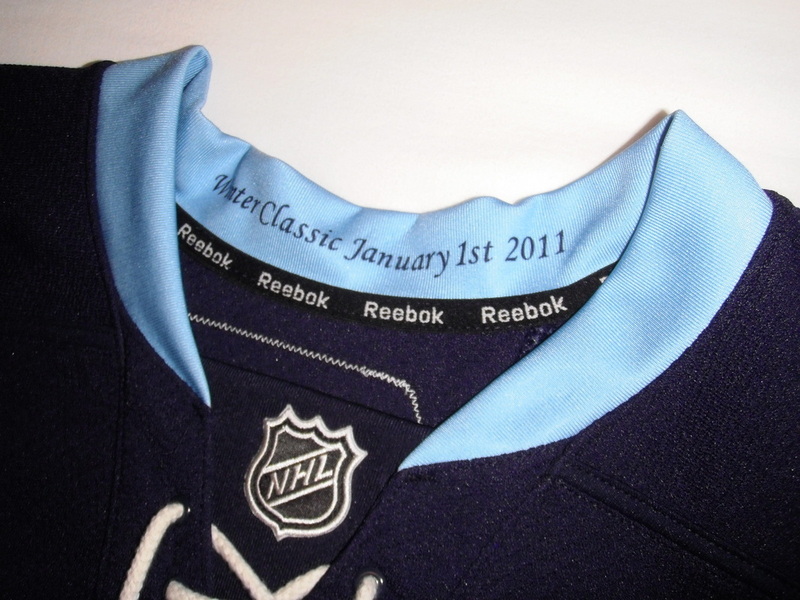 The patch was attached to the home, road, and powder blue alternate jerseys, but not the vintage 2011 Winter Classic style. 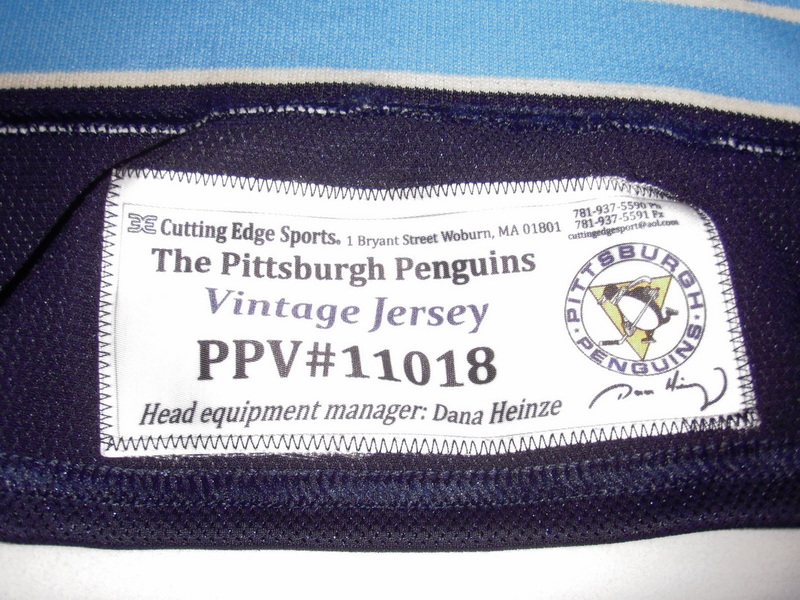 This is the tagging used in the 2008 Winter Classic style Penguins powder blue throwbacks. 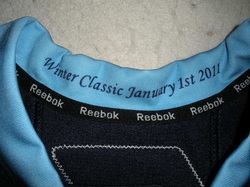 This is the unique serial numbered set that that was attached to the rear hem of the Winter Classic style "Vintage" jerseys that were worn in 2 games at home during the second half of the 2010-11 season. The "Vintage" jerseys also carry the Winter Classic wording in the collar, as it was a carryover from the design made exclusively for the New Year's Day game. The Capitals and Penguins organized a joint effort to raise money for the families of Lokomotiv Yaroslavl, the KHL team that perished in a plane crash 9-7-11 in Russia. 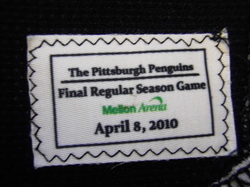 Players wore jerseys with commemorative Lokomotiv patches for this game only, and then autographed the game-worn and game-issued jerseys after the game and auctioned them off on NHL.com. 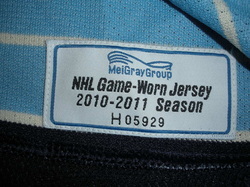 These jerseys were handled by MeiGray and will have their tagging as well. 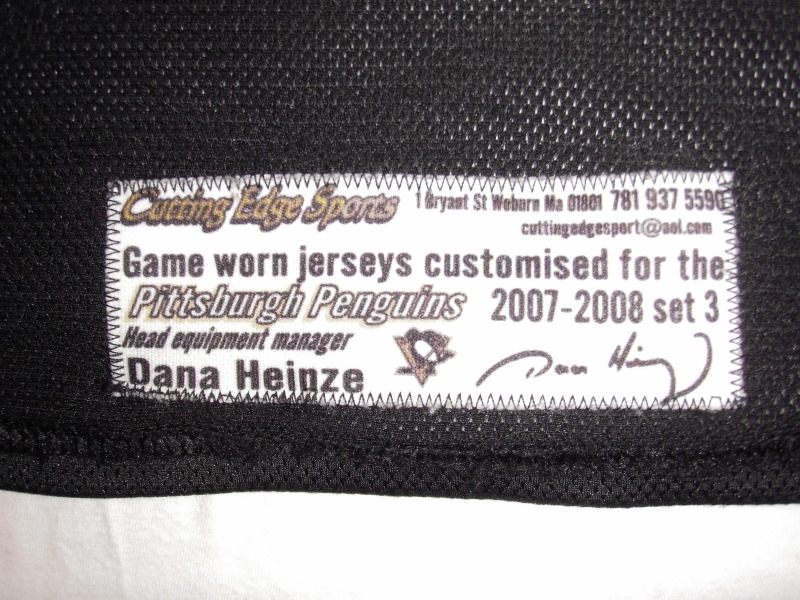 Note that Cutting Edge Sports is no longer doing the Pens' customization. 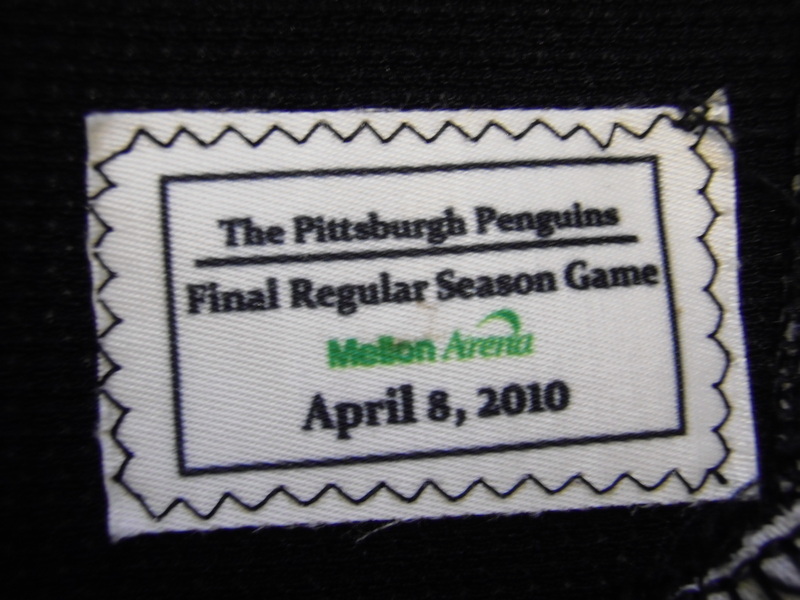 This is the MeiGray tag from Sid Crosby's game issued Lokomotiv jersey. 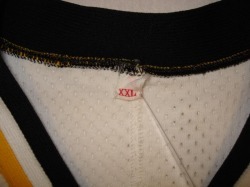 The Lokomotiv patch was attached to the upper chest of the jersey, opposite of the Captain's C.
This set was customized by ProKnitwear. 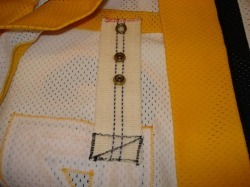 The game jerseys of actual roster players will have the jersey-trac button sewn to the fight strap. 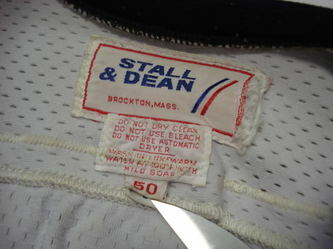 It will resemble a watch battery behind a piece of twill added to the fight strap. 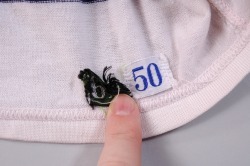 Also the set tags tend to deteriorate in these jerseys very badly after just a few washings. 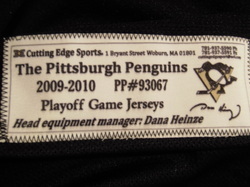 They are nowhere near the quality of Cutting Edge sublimated tags. 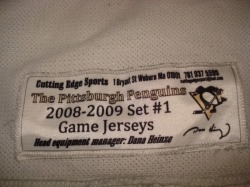 This is from a game issued jersey. 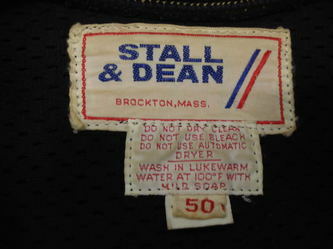 This tag was used in the warm up shirts auctioned off to benefit local service men and women. 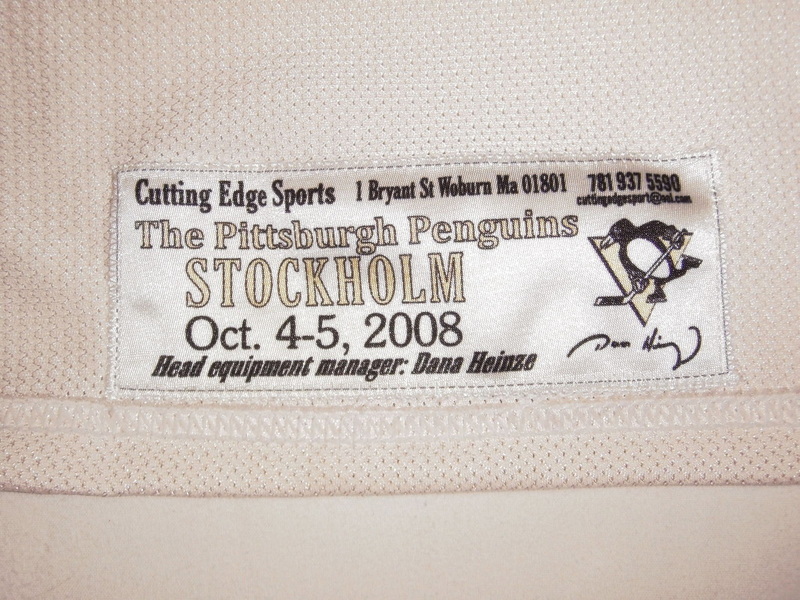 The Pens played Tampa that night and Beau Bennett scored his first NHL goal and Sid had 2 goals and an assist which was enough to surpass Rick Kehoe as the 3rd all time Penguins points leader. 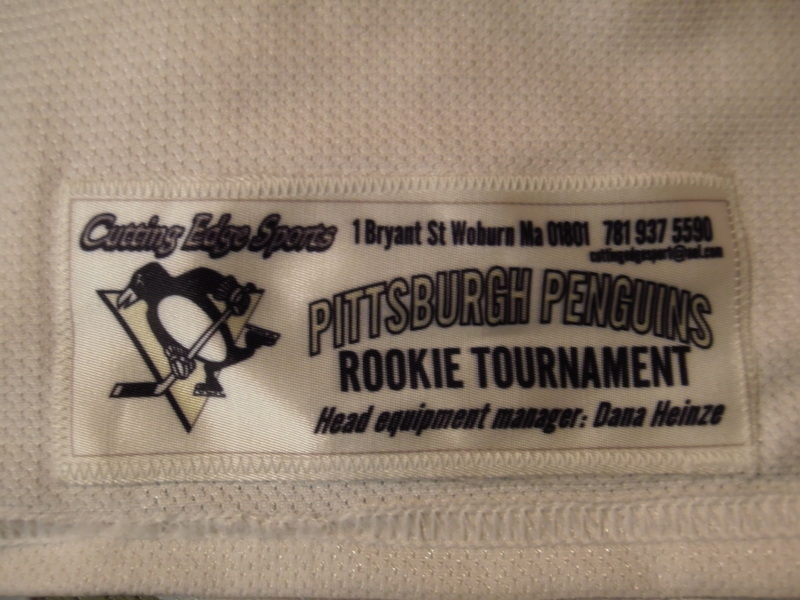 and manufacturer specifics provided by Penguins historian Jim Kubus.